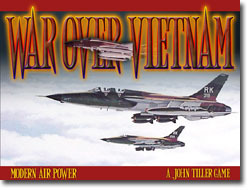 The wargames in the Modern Air Power series cover air warfare in the missile age, from the Vietnam War to present day. The game scale is continuous and real time. Units are at the flight level. 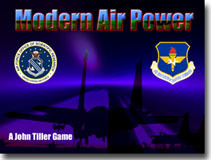 The Single Player Version of Modern Air Power is intended to provide the user with an ability to learn about the basic principles of modern air warfare through a series of "Flight School" scenarios. 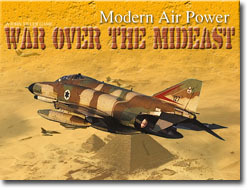 Each scenario is intended to show the user how a particular aspect of the interface or a particular air mission is done. These scenarios range from the basic strike and air superiority missions through cyber warfare and nuclear deterrence. Once a user has finished the Flight School scenarios, they can use their training to take on a "Capstone Scenario" which combines several of the basic tasks into a single scenario. The MAP Single Player Version is available for free on several platforms. Microsoft Windows v1.01 - Requires Windows XP, Vista, 7, 8 or 10. Apple Macintosh v1.03 - Requires MacOS 10.10 (Yosemite), 10.11 (El Capitan), 10.12 (Sierra), or 10.13 (High Sierra). More information is available on the Product Page.